Historic Etz Chaim Synagogue built in the 1920’s. PORTLAND, Maine — On a recent visit, I headed to the historic Old Port district to check out Two Fat Cats Bakery and the homemade pies that have become legendary. Everything I heard was true: the blueberry and strawberry-rhubarb pies at Two Fat Cats were the best I’ve ever tasted. The real surprise of the visit, however, came as I left the Old Port district en route to the highway. At 267 Congress St., I spotted a sign for the “Maine Jewish Museum.” A brick walkway led to a modest building nestled at the end of a lush garden. I’d never heard of the Maine Jewish Museum, so I ventured inside. Along with several other curious travelers who’d been drawn by the inviting garden and the simple but elegant structure, we were greeted by Rabbi Gary Berenson of Congregation Etz Chaim. This congregation and its synagogue date to 1921. 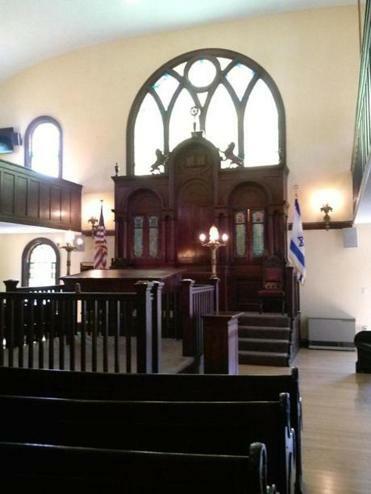 Berenson provided a tour (free, but donations are accepted) of the newly restored building that houses both the museum and the synagogue, one of the oldest remaining European-style synagogues in continuous use in Maine. My accidental tourism had introduced me to one of Portland’s most historical and culturally significant attractions. The Etz Chaim Synagogue (the Hebrew words “Etz Chaim” mean “tree of life”) was constructed in the simple but elegant style of the classic European shul, the places of worship that the immigrants making up Portland’s Jewish community at the turn of the century had left behind as they fled pogroms and persecution. By the early 1920s, Portland boasted a substantial Jewish population; the downtown district was home to three synagogues and many Jewish-owned businesses. But as the decades passed and the population dwindled, the synagogue fell into disrepair. Downtown Portland is now a vibrant, even trendy neighborhood with upscale rents. But as recently as the 1990s, the city was battling economic downturn and rapidly changing demographics. Even though prayer services were still being held in the small chapel, many assumed that the synagogue had long been abandoned. Some intrepid members of the Jewish community organized to restore the building as a museum of Jewish art, history, and culture since there was nothing else like that in Maine. By 2007, plans were well underway to reinvent the building as a multi-use facility: besides revitalizing Etz Chaim Synagogue, the museum showcases historical artifacts and contemporary art work. In 2009 the repair process reached a milestone when the synagogue’s suspended ceiling, which had become a nesting place for pigeons, was removed and restored to its original height and detail. The stained glass windows that had been bricked over were repaired or replaced. According to Berenson, 60 percent of the stained glass is original; the rest is new glass from the original supplier in Pittsburgh. The centerpiece of the sanctuary is the ark, which holds nine Torahs. Renovations are still ongoing; earlier this summer, an elevator and accessible restrooms were installed. According to Berenson, Boston’s Vilna Shul, which was built in 1919, saved from the wrecking ball and transformed into an historical site and thriving community landmark, assisted the Maine Jewish Museum with its own restoration. Just as Vilna Shul is now part of the gentrified Beacon Hill neighborhood, the Maine Jewish Museum is a jewel along Portland’s Congress Street, currently home to both new arrivals and a burgeoning hip neighborhood. The Museum’s first level boasts an art gallery of rotating exhibits by contemporary Jewish artists from Maine, curated by Nancy Davidson. The second level is the synagogue, accessible either by the elevator or by two central staircases. Display cases at the rear of the sanctuary detail the renovation project with “before and after” photos. The third floor (once the “women’s balcony” of the previously Orthodox congregation) houses a photography exhibit by Jack Montgomery titled “Soul Survivors: Legacy of the Holocaust,” along with personal accounts by Jewish residents of Maine. In the alcove of the new elevator addition, more photographs and text tell the history of the Jewish settlers in cities and towns throughout Maine and a timeline from the turn of the century to the present. With its thoughtful embrace of past and present, the Maine Jewish Museum offers visitors a better understanding of both.